This is an In Person Signed piece of white paper 4.5" x 3" by the late English character actor and wrestler. 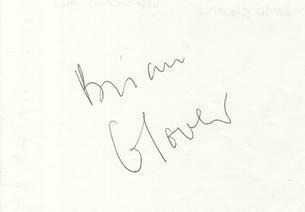 Brian Glover (2 April 1934 - 24 July 1997) was an English character actor, writer and wrestler. Glover was a professional wrestler, teacher and finally a film, television and stage actor. He once said, "You play to your strengths in this game. My strength is as a bald-headed, rough-looking Yorkshireman".